Abu Dhabi, 23 April 2018: In celebration of Year of Zayed, marking the 100-year anniversary of the late Sheikh Zayed bin Sultan Al Nahyan’s birth, the Department of Culture and Tourism – Abu Dhabi (DCT Abu Dhabi) is featuring an interactive art installation to pay tribute to the nation’s Founding Father at Arabian Travel Market (ATM) 2018, the largest travel trade show in the region. The unique mix between tradition and state-of-the-art technology is already drawing an influx of visitors to the Abu Dhabi stand located in Hall 2, stand number ME2115 & ME2250 at the World Trade Center in Dubai. The interactive art installation, entitled “Zayed Wall”, displays imagery provided by the National Archives of the late Sheikh Zayed. When prompted, images come together to collectively create one special artwork in commemoration of his living legacy. Visitors can interact with the installation by zooming in on a picture of interest and receiving more details about it. 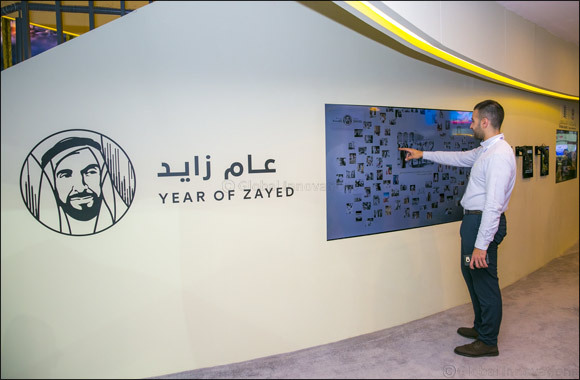 Through this installation, DCT Abu Dhabi is aiming to pay tribute to the late Sheikh Zayed who paved the way for Abu Dhabi to emerge into a destination of distinction. During its participation at ATM, DCT Abu Dhabi’s delegation is putting the spotlight on the Emirate’s culturally enriching experiences and unique natural landmarks while bringing to life elements of the Emirati heritage and tradition. DCT Abu Dhabi is joined by 77 industry stakeholders including government departments, hotels, resorts, tourist attractions, leisure facilities, destination management companies, travel and holiday agents – all gathered to showcase over 95 tourism services and products. The Emirate witnessed a record-breaking year in 2017 with hotels receiving around 5 million (4,875,499), an increase of approximately 10% (9.8%) compared to the previous year. Promotional tours and participation at key industry events such as ATM help the Emirate realise its ambitious aspirations of attracting 8.5 million visitors by 2021. The Abu Dhabi stand has dedicated zones highlighting its diverse offerings such as Cruise Tourism, Abu Dhabi Convention Bureau, Qasr Al Muwaiji, Louvre Abu Dhabi, Emirati Experiences, National Archives, Overseas and Promotion Offices, among many others, in addition to the presence of public sector entities including the Sheikh Zayed Grand Mosque, Department of Economic Development - Abu Dhabi, Federal Authority for Identity and Citizenship, and Abu Dhabi Airports.